Anabolic Labs DAA 750 is the revolutionary new testosterone elevating compound that has been shown to boost testosterone levels by an astonishing 35% in as little as just 12 days of use. DAA750 achieves this by stimulating the production of signal molecules which in turn enhance the activity in your testes and pituitary gland leading to the enhanced elevation of your natural testosterone levels. This increased testosterone directly effects protein synthesis ensuring that your bodies ability to repair damaged muscles and add hard lean muscle mass is optimised as your body is now able to assimilate a higher percentage of the protein you eat. Raised testosterone levels also helps support fat loss as your body is able to assimilate fat more effectively as an energy source, leading to a more defined muscular physique. 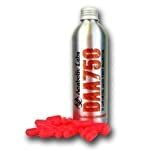 DAA750 is the the perfect supplement for anyone wanting to boost their testosterone levels naturally and is the ideal PCT for use after a anabolic course. Hyper 1 pack (100 tablets – 130 gr 1 g of arginine per tablet) L-Arginine amino acid anti-aging power of building muscle mass building The essential amino acid L-arginine is the precursor of NO (nitric oxide). Hyper 2 pack (100 tablets – 130 gr for a total of 200 tablets – 260 gr 1 g of arginine per tablet) L-Arginine amino acid anti-aging power of building muscle mass building The essential amino acid L-arginine is the precursor of NO (nitric oxide).